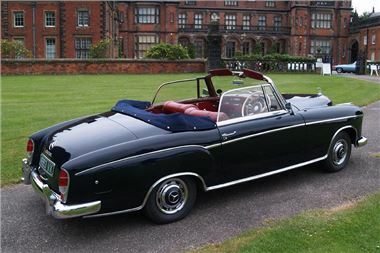 An original example of archetypal ‘Ponton styling’ will be on show when a rare 1960 Mercedes-Benz 220SE Ponton Cabriolet heads to Historics’ auction block, for its Summer sale on 19th July at Brooklands. Deriving from the German word Ponton, meaning pontoon, the design trend reputedly originated from the German wartime practice of adding tread armour along the full-length of tank sides, and typically led to the integration of the front fenders within the full-width, full-length bodywork. One of only 17 right-hand drive models from approximately 2000 220SE Coupé and Cabriolet models manufactured, the six-cylinder ‘soft top’ on sale at Historics auction bears all the hallmarks of the obviously oversized, slab-sided appearance of vehicles in the post-war Ponton period. It is harnessed however in the style and luxury of a cabriolet configuration, to create a highly sought-after Grand Tourer. Developing the 220S, Mercedes-Benz’ 220SE model was boosted by a fuel-injected version of the 2.2-litre overhead-camshaft straight sixengine, with maximum power increased from 106 to 115bhp, and while top speed remained unchanged at around 100mph, there was a noticeable improvement in acceleration with the 0-60mph time being reduced by two seconds. Finished in black with contrasting blue hood, the elegant tourer still sports the original maroon leather interior, and from its delivery in 1960 until 2004, was kept in London and maintained by marque specialists, Portland Motors. Since 2004 the car has seen only occasional use at Mercedes-Benz rallies and events, and in line with the type of attention afforded cars of this rarity and condition, it is expected to encourage bids in the region of £85,000 to £95,000. For more information, and to attend the Historics at Brooklands auction on the afternoon of Tuesday July 19th, call 0800 988 3838, e-mail: auctions@historics.co.uk, or see the website, www.historics.co.uk. Entry by catalogue only, available prior to, or on the day of the auction.